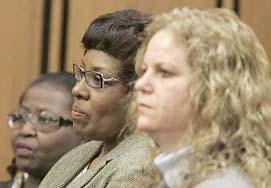 CLEVELAND – Two election workers were convicted Wednesday of manipulating a recount of the 2004 U.S. presidential election to avoid a more thorough ballot review in Ohio's most populous county. Ohio gave U.S. President George W. Bush the electoral votes he needed to defeat Democratic Senator John Kerry in the close election and hold on to the White House. However, a special prosecutor did not claim that the workers' actions affected the election's outcome. Kerry gained 17 votes and Bush lost six in the county's recount. Maiden and Dreamer, who still work for the elections board, face a possible sentence of six to 18 months for the felony conviction. Sentencing is Feb. 26. Michael Vu (30, executive director of the Cuyahoga County Board of Elections, $119,000/year salary) although unindicted, resigned on 6 Feb. 2007. Cuyahoga County contains the Democratic stronghold of Cleveland. Immediately following the 2004 election 562,498 votes were reported cast with 30,791 listed as absentee or provisional ballots. But the official results show 468,056 counted in Cuyahoga. Hence 94,442 ballots cast in the unofficial total officially disappeared. That's 16.8% of all the votes cast in Cuyahoga. Other Ohio counties with large vote losses include Auglaize (15.7%), Coshocton (14.1%), Jackson (11.3%), Licking (14.1%), Lucas (10.6%), Morrow (17.4%), and Tuscarawas (11.7%). These happen to coincide quite nicely with pro-Democrat counties.